Neon colors paired with glittery metallics might seem like a gaudy proposition. Fear not – in moderation, this type of color combination can look modern and a little glam. The sentiment stamp I used, “May your birthday Sparkle,” was the catalyst for this creation. Glitter was the first thing that came to mind, followed by the question, “What if I pair it with neon?” I used white to balance the neon pink, gold glitter and platinum. This card is very festive and perfect for a birthday. I’ll be keeping this palette in mind for the holidays. 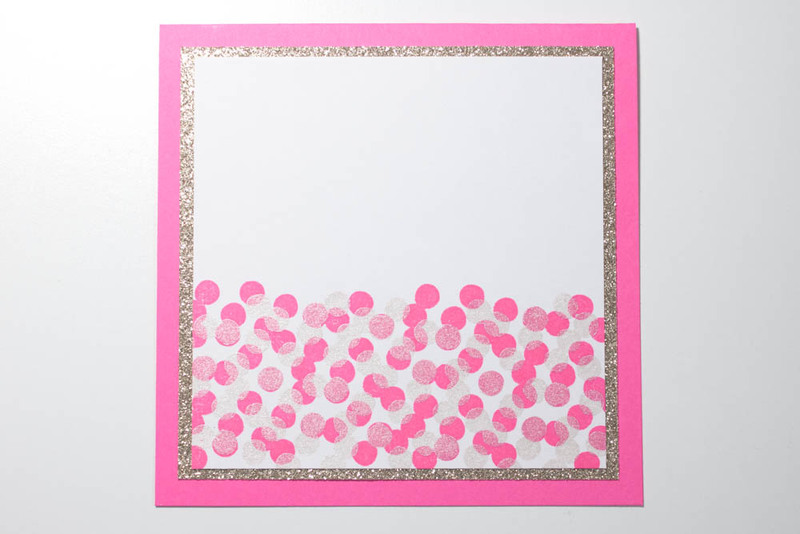 Make a card from a 5-by-10-inch piece of neon-pink cardstock (such as from the South Beach collection by Recollections). Cut a 4 1/2-inch-square piece of gold-glitter cardstock (mine’s from Best Creation Inc. in bright gold) and adhere it, centered, to the card’s front. Cut a 4 1/4-inch-square piece of white cardstock. Stamp a large image of scattered dots (I used confetti dots by Josephine Kimberling for Impress Rubber Stamps) in neon-pink ink (mine’s by Hero Arts) onto the bottom half of the white cardstock. 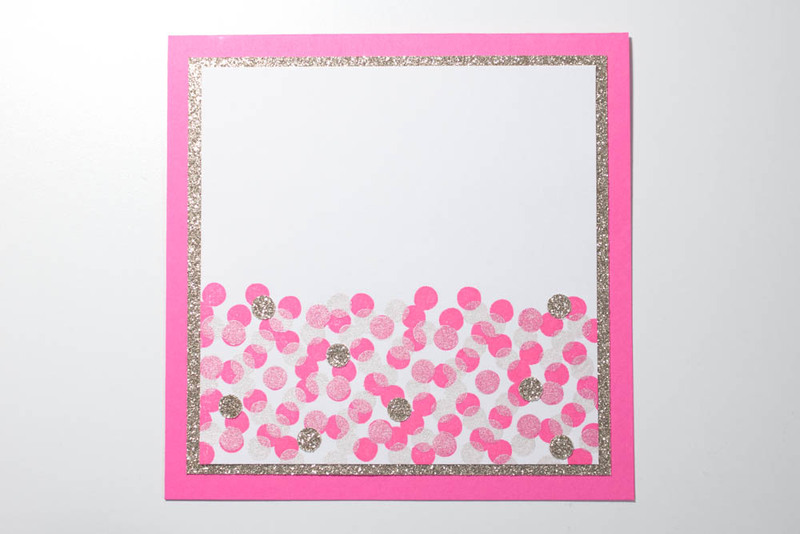 Stamp the image again in metallic champagne ink (I used Brilliance ink in platinum planet) over the neon-pink dots. Adhere the white cardstock, centered, over the glitter cardstock. 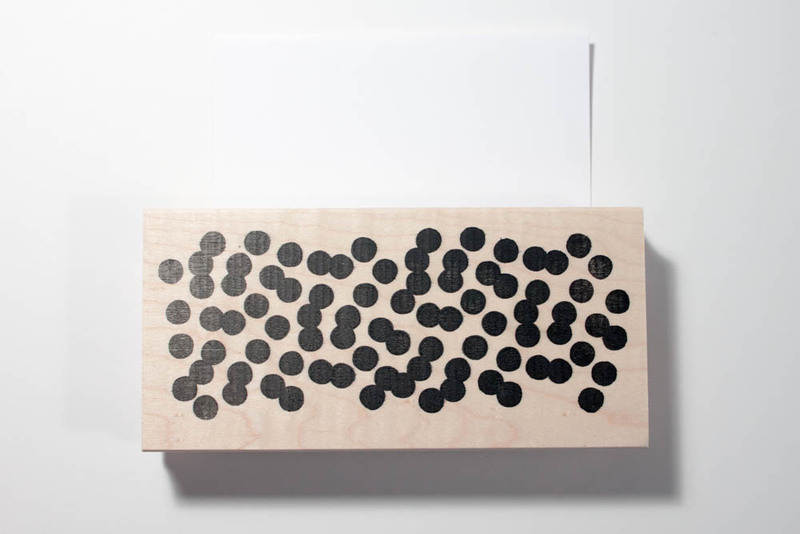 Using a hole punch, punch several circles out of gold glitter cardstock. Adhere the circles in a random fashion onto some of the metallic stamped dots. Cut a piece of neon-pink cardstock to 1 1/2 inches by 2 1/2 inches. 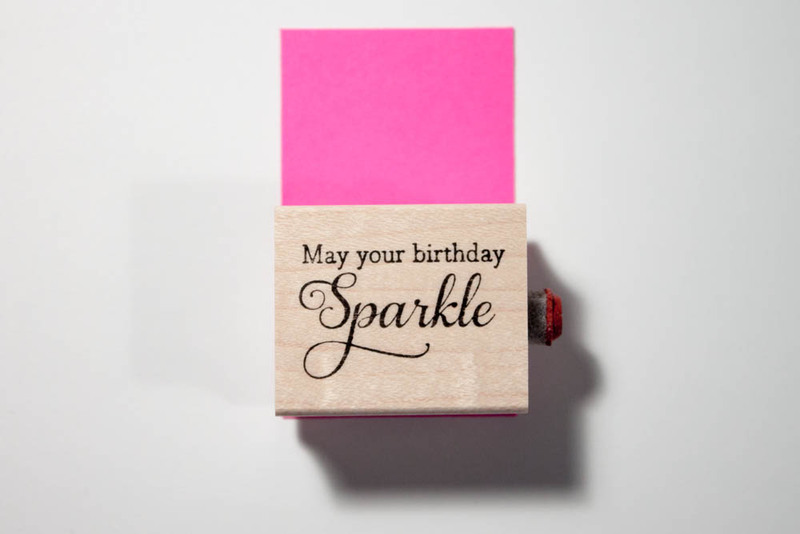 Stamp a birthday sentiment (such as “May your birthday Sparkle” from birthday sparkle combo by Josephine Kimberling for Impress) in white ink (I used ColorBox Cat’s Eye Queue Baby’s Breath collection in frost white) onto the bottom portion of this piece. 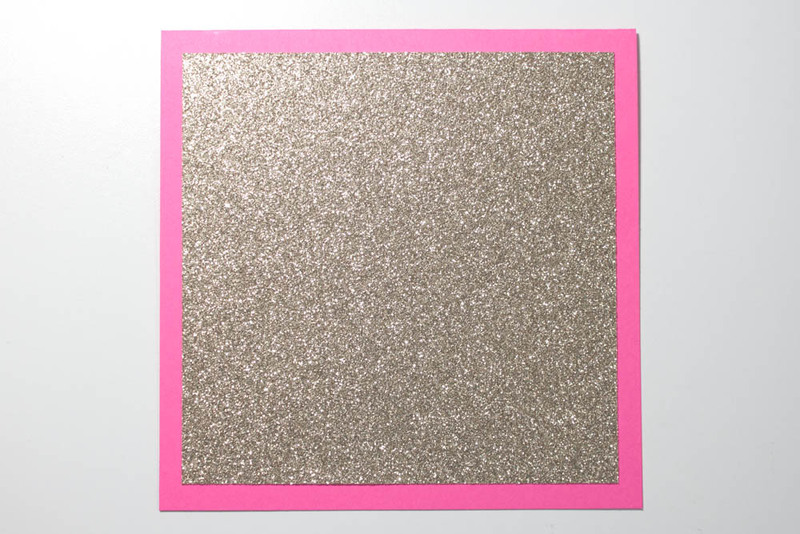 Cut a piece of gold glitter cardstock that’s slightly larger than the neon-pink piece and adhere the pink piece, centered, over it. Using dimensional adhesive, adhere the gold piece over the dots, off-center. This entry was posted in Birthdays and tagged glitter, neon. Bookmark the permalink. This is a really striking combination! 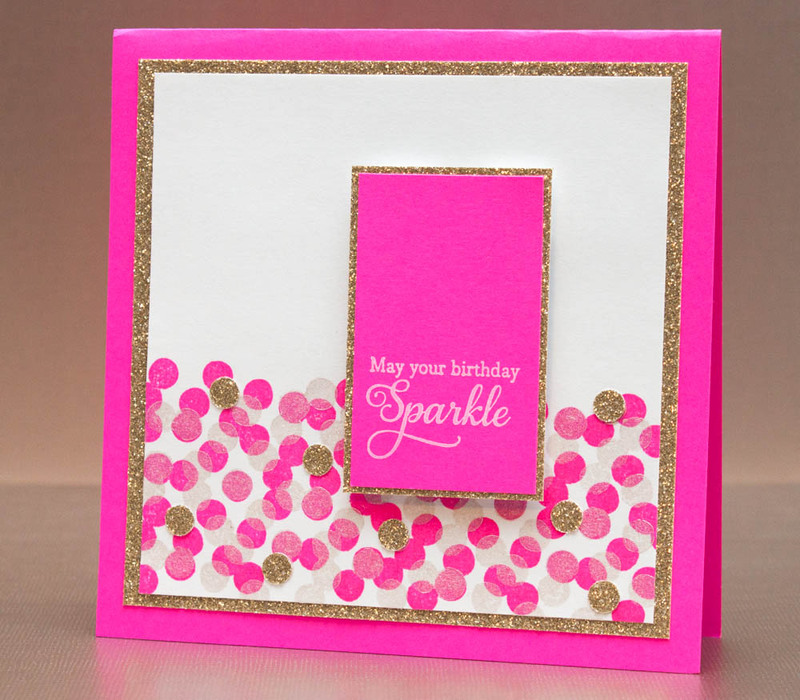 I never would have thought to try pairing neon with sparkles but it really works with this card. Thanks for the explanation of your process. The white dots over the neon pink really help to balance the colors. Neon with glitter is a striking combination! Beautiful! LOVED how you used that stamp! Fantastic colors and great use of your stamp ! I have to admit…I am not a big fan of neon but this card is beautiful. The gold and pink work great together. Thanks for inspiring!! !